Product description from the website: This book features important notes in American history and is geared for the elementary or upper elementary student. Upon completion, your student will have the opportunity to master twenty-four history passages in history, along with selections of American documents. For variety, art lessons are sprinkled throughout the book. This book features tracing cursive letters and coloring pages from history, people and cultures around the world. This book is geared for the preschool or early elementary student who is just beginning to learn their cursive letters. Your student will build their confidence in their cursive letters while they improve fine motor skills and hand-eye coordination. Mary has really enjoyed the PreScripts Cursive Letters and Coloring - World History book (shown above)! I like that she's coloring the CC timeline cards, too! Brandy at Half-a-Hundred Acre Wood has a very detailed review of these new materials, and you can read what she says by clicking here. What do I think about these books? I think they're wonderful resources, and I can't wait until we can use them more. I love the idea of combining handwriting, Art, and history memory work together! Handwriting has been a battle for over a year now, and I've chosen to let Mary take the lead in this area. When she was four, we started with a popular program that promised no tears in handwriting, which, ironically, led to tears shed by everyone. I stopped. I figured that she'd pick up on it when she was ready. It was hard because all of my homeschooling friends were talking about doing handwriting with their kids, and we just couldn't make it work. Was something wrong? Was her aversion to handwriting an early indicator of a bigger problem? I'm learning that Mary is Mary, and she picks up things in her own time. Little Little Inger Lost her finger. Isn't that amazing?! And check out her awesome illustration! That line under her last name is Inger's finger flying off! Yes, she has a couple of minor issues with using a capital letter when she should use the lowercase (mainly on F, D, N, and L), but she enjoys writing, so I'm as pleased as could be! She then draped herself in a blanket and declared herself the Drama Queen. Ha! Okay, so she likes writing, but she does have a few things we need to correct (the capitals mentioned above). I've started to encourage her to use the correct form of the letter, and I've had her do a couple of free worksheets found online that have her trace the lowercases, just so I know she knows those formations. She does, so now it's just a matter of breaking the bad capital habit. We're working on it, and I think adding some copywork to our daily schedule will really help. I realize that I've totally strayed from my review of CC's awesome PreScripts books, please forgive me. Let's get back to those. . . The PreScripts series is wonderful, and Mary did a great job with the letter a in the cursive letter book. She loved the coloring, too. But, when we got to the letter b, she had a rough time, and we had some tears. So, we backed off the cursive - for now. Mary loves anything fancy, and she's excited to learn 'fancy' writing, but I don't want to push it. Do I honestly recommend the PreScripts books? Will I really use them? Here's the page of tracing and copy work above. And here's the corresponding art lesson. The lessons are all different; this one talks about motion, foreground, and background. Then it has a place for the child's drawing on the next page, as you can see. Good stuff! And we'll definitely do it when the time is right! There you have it! 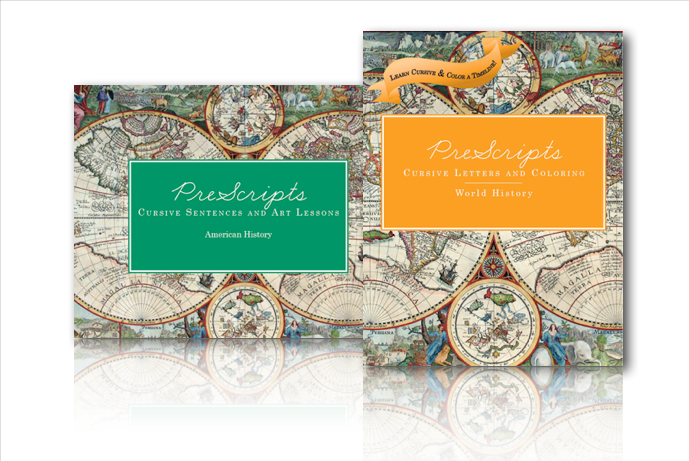 Those are my thoughts on Classical Conversations's new PreScripts books. I'd love to know your thoughts on them and handwriting instruction in general! I'll take any help I can get! Also, I'd like to take a quick minute to apologize for not responding to all the comments in previous posts (I'm so glad you like the new Opera Cards!). I read every single comment, and I'm so appreciative of your taking the time to share your thoughts! I'm going to try to do better responding in the future. If you have a question about anything, please send me an email. My contact info. is at the top of this blog, and a direct email will usually always get a quicker response than a comment (although I love both!). I was given these books at no charge in exchange for an honest review. I think the books are great, and that's my honest opinion. Thanks for reading the fine print! I LOVE these new books from CC!!!! AWESOME!! You are such a wise Mama to back off on handwriting and wait til Mary's more ready. She will get there! !